Above: A publicity portrait of Allan Lane from one of his 1950s B-westerns. Allan Lane was athletic and ruggedly handsome in appearance, and his voice was a highly distinctive one, an authoritative baritone that sounded both tough and intelligent. His appearance and voice both helped him to establish his heroic credentials as soon as he came on screen–a great asset in a fast-paced medium like serials. His friendly but firmly level-headed demeanor suited him well in the numerous sheriff/Mountie/army officer roles he played throughout his serial and B-western career.. Lane’s screen image was that of a clear-thinking, likable troubleshooter, a hero who was capable of dealing cooly and directly with any villain or dangerous situation, without seeming dull in the process. Lane was born Harry Albershart in Mishawaka, Indiana. He began his acting career while still in high school, appearing with some local theatrical stock companies; before he was out of his teens, he had toured much of the Midwest and traveled as far afield as New York and Los Angeles with other acting troupes. When he wasn’t acting, he was playing sports as a member of semi-pro Midwestern teams like the Traverse City Resorters (baseball) and the Cincinnati National Guards (football). His good looks and athleticism eventually brought him to the attention of Hollywood; he made his screen debut there in a Fox revue production called Movietone Follies of 1929. Under his new screen name of Allan Lane, he played bits, a few leads, and supporting “juvenile” roles in society dramas, comedies, and the like for the next few years, working on Broadway when not doing pictures. Dissatisfied with film acting, he left Hollywood in 1932, apparently returning for a while to his sports career before winding up in New York, where he worked as an advertising model before opening his own commercial photography studio. Though he made a success of this business, he left it in 1936 when Fox executives persuaded him to come back to Hollywood, promising him larger roles than those he’d enjoyed during his first sojourn in Los Angeles. During the remaining years of the 1930s, Lane played leads and sizable supporting roles in upper-echelon B-films for Fox, RKO, and other studios–chiefly comedies (Maid’s Night Out, in which he co-starred with a young Joan Fontaine) and mysteries (Conspiracy, Crime Ring). He also worked for Republic Pictures during this period, starring in the 1937 boxing drama The Duke Comes Back; the studio would remember him when casting their 1940 serial, King of the Royal Mounted. Based on a popular comic strip created by Zane Grey, King of the Royal Mounted starred Lane as Sergeant Dave King, a steadfast Mountie battling a gang of Nazi agents who were secretly mining a chemical compound in Canada, a compound that could help the Germans overcome Britain’s naval defenses. King of the Royal Mounted was full of rousing action and impressive forest locations, and featured some genuinely emotional moments in between the fights and chases. Lane handled both action and drama with aplomb; his reaction to the death of his father (Herbert Rawlinson) in the third chapter was understated but quite moving. King of the Royal Mounted was one of Republic’s best serials, and it was also the start of a long and profitable relationship between Allan Lane and Republic Pictures. Above: Allan Lane hitches a ride on the tail of a villain’s airplane in King of the Royal Mounted (Republic, 1940). Above: Allan Lane regains dry land after being nearly swept over a dam. Robert Kellard aids Lane in this still from King of the Royal Mounted. Lane’s career in feature films began to peter out right around the time he made King of the Royal Mounted; his aloof, rather prickly off-screen personality and his disdain for the Hollywood social scene had cooled major studios’ interest in him as a potential star, and he only played a handful of bit parts during the first few years of the 1940s. His next role of note was in his second serial for Republic, King of the Mounties (1942), in which he reprised his Sergeant King characterization. The heavies in Mounties were a trio of Axis spies (one Japanese, one German, one Italian) who, with the aid of local Canadian outlaws, were wreaking havoc on Canadian defenses with a flying “Falcon Plane.” King eventually brought the villains’ schemes to an end when he precipitated the explosion of their volcano headquarters. King of the Mounties was another big hit for Republic, and firmly established Lane as the studio’s leading serial hero. In fact, Republic would hail him as “The Serial King” in the publicity material for his next cliffhanger. Above, from left to right: Allan Lane, William Bakewell, and John Hiestand in King of the Mounties (Republic, 1942). Above: Allan Lane has the drop on Anthony Warde in King of the Mounties. That next cliffhanger was Daredevils of the West (Republic, 1943), in which Lane, the newly crowned “Serial King,” co-starred with Kay Aldridge, billed by Republic as the Serial Queen following her success in Perils of Nyoka (Republic, 1942.) Aldridge played June Foster, attempting to finish her murdered father’s work on a frontier stage line, despite opposition from outlaws and Indians commanded by cunning frontier businessman Martin Dexter (Robert Frazer). Lane was Captain Duke Cameron, a Cavalry officer assigned to get to the bottom of the attacks on the stage line; while working as foreman of the Foster project, Cameron battled the villains almost continuously for twelve chapters. Daredevils of the West was one of the most action-packed serials Republic ever made, with fistfights and gun battles galore. Lane’s strong screen presence was an especial asset to him in this serial, since it kept him from being completely submerged by the cliffhanger’s breathless pace. Above: Allan Lane outlines his plans to commanding officer Stanley Andrews (back to camera) in Daredevils of the West (Republic, 1943). Above: Allan Lane gets tough with a crooked bartender in Daredevils of the West. title role, as the white princess of a jungle tribe whose lands were rich in oil. Lane was engineer Allen Saunders, an oil company agent who battled the forces of a ruthless rival company bent on stopping his drilling project. The Tiger Woman and her tribe supported Lane and his partner Duncan Renaldo after the heroes won their trust, and in the final chapter Lane aided Stirling’s character in discovering her true identity as a long-lost heiress to a fortune desired by the villains. The Tiger Woman, though tailored as a vehicle for Stirling, gave top billing and plenty of screen time to Lane, who delivered another solid performance as an unflappable troubleshooting type in his final cliffhanger. 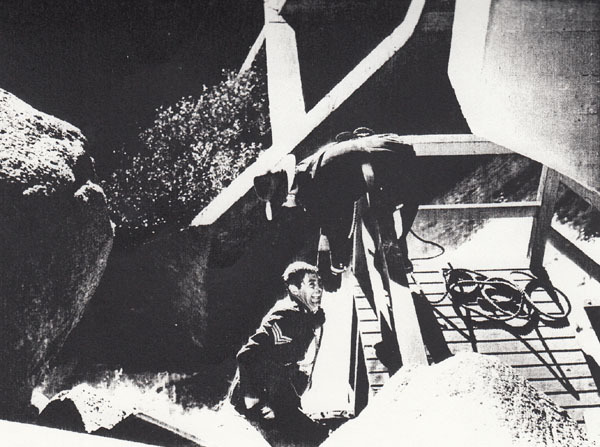 Above: Ken Terrell tries to make Allan Lane take a dive in a fight scene from The Tiger Woman (Republic, 1944). Above: Allan Lane (right) prepares to surprise a band of heavies in The Tiger Woman. George J. Lewis is in the center of the villainous trio. Following The Tiger Woman, Republic moved Lane over to B-Westerns, using him to replace Don “Red” Barry, who was in turn moved into bigger-budgeted non-Western features. After starring in six westerns originally written for Barry in 1944 and 1945, Lane was next moved to Republic’s “Red Ryder” B-western series, replacing Wild Bill Elliott as the comic-strip cowboy. Lane starred as Red Ryder from 1946 to 1947, and when Republic lost the rights to the character due to a clerical error, the studio quickly created another series for the popular Lane, giving him a new nickname (Rocky) and a new sidekick, Eddy Waller. The Allan “Rocky” Lane B-western films (38 in all) featured clever scripting and interesting plots as well as good action, and remained reliable money-makers for Republic until 1953, when the studio began to shut down their B-western department. Lane then turned to TV, spending most of the later 1950s playing villains, sheriffs, and other supporting characters in Western shows like Colt 45, Gunsmoke and Texas John Slaughter (in which he had a good bit as the cynical, world-weary gunman Johnny Ringo). He also played character parts in A-westerns like Saga of Hemp Brown (1958) and Hell Bent for Leather (1960), before being chosen to voice the talking horse Mr. Ed on the popular sitcom of the same name. Lane turned his distinctive voice to amusing effect in voicing the sarcastic and eccentric Ed, displaying a talent for comedy never tapped in his serials. Mr. Ed ran from 1960 to 1966, and Lane retired at the end of its run. He died in 1972. Notoriously blunt and critical off-camera, Lane was quite deprecatory of his own acting in his later years–but his film work was much more impressive than either he or some of his more outspoken co-workers (like director William Witney) would have admitted. His B-western work was consistently first-rate, and the same can be said for his chapterplay work. Few serial stars were better-suited, physically or vocally, to playing responsible and authoritative heroes, and few could give such characters enough personality to keep them from being uninteresting–as Lane managed to do, time and again. Above: A publicity portrait of Allan Lane from King of the Mounties (Republic, 1942). Acknowledgements: My thanks to Linda Alexander, whose book I Am Mister Ed…Allan “Rocky” Lane Revealed (Bear Manor Media, 2014) provided me with a wealth of biographical material concerning Lane. The book, a well-researched and highly informative volume that paints a nuanced and sympathetic portrait of the actor, is available via the publisher’s website. Very nicely-done! Thanks for referencing my book. You’re quite welcome; my thanks to you for researching and writing it in the first place. It was really a godsend to get ahold of more concrete information on Lane than I’d ever had access to before. I just discovered your site – great stuff, and I really appreciate your attention to detail. I think it might be of interest to some of your readers that included in the free videos for Amazon Prime are 16 Allan Lane westerns. I’ve watched all of them and they are high quality prints that look great on big screen televisions. In my opinion they are quite good in every respect – the last paragraph of you article confirming my feelings about his work – thank you. I’m not an “agent” or advocate for Amazon, but for those that have Prime and are interested – they are available and free to Prime members. Thank you for a very informative and interesting website.